I saw the Remington R-15 at Academy Sports when the gun panic of the Obama presidency was winding down a bit and .223 ammo was becoming available on the shelf again. Up until that point, I had decided I would not buy any AR-15 type rifle until prices had stabilized and ammo became available. So the Remington R-15 came into view at an opportune time and at a reasonable price. Glad I didn't buy one of those "panic" ARs that were priced $500 over what they were worth. 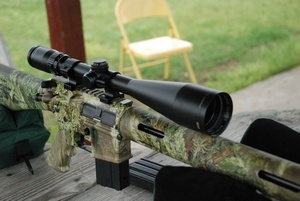 Remington R15 rifles are intended for varmint and predator hunting with several barrel lengths and configurations to choose from. 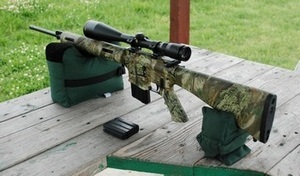 My Remington R-15 was the model with a 22 inch free floated ChroMoly steel barrel and fixed stock. All Remington R-15 models are finished with Advantage® MAX-1 HD™ camouflage designed to blend nicely with a variety of landscapes. 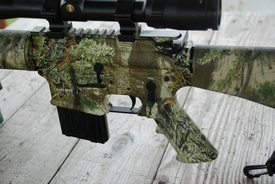 Controls are standard AR-15 on both sides of the rifle, as are other features. The gun accepts AR-15 accessories and magazines. When I showed the rifle to a friend of mine who is fresh out of the army, he proceeded to completely disassemble it. I was kind of concerned considering we had a bunch of guests in the next room and had to get back out to them, but just about as quick as he took it apart, he put it back together again. Being new to the rifle, I've now cleaned it a few times and one time completely disassembled it, though my time was not nearly as impressive as his. Since this gun in the series is designed for longer shots (and just because I like big scopes), I mounted a Bushnell Elite 3200 3-9x50 scope on the receiver-length Picatinny rail. The results were nice and after setting up and adjusting the scope for my eye relief, I was off to the range to sight it in and see how it shot. It took a few minutes to get used to the particulars of the rifle and getting it set on the Caldwell bag where I could put it on target and keep it comfortably tucked in to my shoulder. When I finally started shooting, what was immediately evident was the lack of recoil in the Remington R-15 predator rifle. The weight of the gun and the gas system left the scope right on the target without any significant movement when firing. The gun could be shot all day comfortably. .223 ammo I used initially in the Remington R-15 was Remington UMC, Monarch Brass, and inexpensive Monarch steel case ammo, all with 55 grain bullets. Each shot dependably and once sighted in, all were accurate. 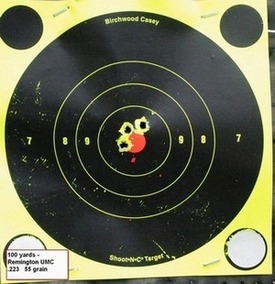 The gun was sighted in at 100 yards and the results below are typical of three rounds fired consecutively with any target ammo. After the initial sighting in at 100 yards, I took aim on a target at 200 yards to see how straight the bullet shot at that range. 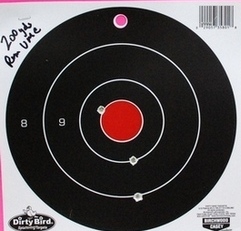 The target below shows how the bullet dropped. The final of three shots is the one on the edge of the red center. The shots fired consecutively showed about a two inch drop at 200 yards. If used for hunting, sighting in at 100 yards and lifting the cross hairs a couple of inches out at 200 yards should provide dependable kill shots. As of this writing, I haven't done anything longer. I've had the Remington R-15 VTR out for several range sessions and some fun plinking with the Right On Target group now. The gun is a barrel of fun to shoot, and accepts any AR style magazine. It comes with a five round magazine, but clearing a hill full of zombies would be a cinch with a 20 or 30 round after market mag. The last time out with the group, the gun was a favorite with people lining up to shoot it. 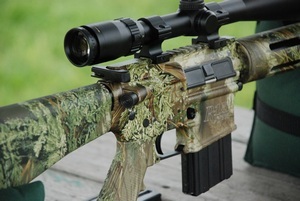 A note here: The Remington R-15 predator rifle can be purchased in a custom model that has a two stage competition trigger and other features for fine tuning the rifle for hunting or competition. BOTTOM LINE: The Remington R-15 should be a real keeper for a hunter particularly. While I'm not anything close to being anything that could be considered a hunter, I love to shoot and I especially love shooting this gun. With .223 ammo back on the shelf at bargain prices and a versatile, high quality, accurate gun, this gun hits rifle heaven. The Remington R-15 is not cheap, but is reasonably priced at major retailers at around $1100. Adding the scope adds about $300. Considering the quality and fun and the cheap ammo, if you can spring for the initial cost, you'll have a winner with this gun.